During the spring of 1966, Turkish community in Cologne, Germany, bought an abandoned auto mechanic shop to turn it into a mosque. It would be the first mosque ever in Germany of the Turkish community so it was a joyful day for them. Having been living in Germany for almost a decade, Turks in the city would finally have their own mosque to pray. The single-floor shop was surrounded by residential buildings in Barbarosaplatz neighborhood of the city and was not visible from the street outside which provided a sort of secrecy needed. Ensuing mosques not just in Cologne but also in whole Germany were also convert structures in the back yards of residential buildings. These mosques had been dubbed “back yard mosques” by the Turkish community. In the following decades, the shapes and architectures of the mosques have altered from these “back yard mosques” to Ottoman-style ones and more contemporary ones. What decided their shape and architecture is the political climate in Germany, according to one Turkish academic. Turkish people have started moving to Germany to search for a better financial life after the two country signed a labor agreement in 1961. They were presumed to return home since their work contracts were temporary but booming German economy following the World War 2 was in desperate need of workforce so most Turks preferred to settle in Germany rather than going back to Turkey which was economically in dire state back then. First generation Turks prayed in the basements of factories they worked at or dormitories where they lived. But after securing jobs and housing, Turks in Cologne have searched for ways to open a mosque for the ever growing community in the city. Barbarosaplatz mosque was the first one. It was followed by Sultan Ahmet Mosque in Mulheim district. Most of the mosques opened afterwards were so-called back yard mosques. German local authorities would only issue permits to these “back yard mosques” because relative invisibility of these mosques were somewhat necessary at the time as German public were not ready to witness proliferating Muslim worship places. It took Turkish community a couple of decades to practice their right to build more visible worship places. Turkey’s Ak Party came to power during an election at the end of 2002. Then-Prime Minister Recep Tayyip Erdogan’s Government carried out unforeseen reforms to bring the country closer to western standards in terms of human rights. Those reforms opened the European Union membership window for Turkey which it had been pursuing the membership goal for almost four decades. The climax in Turkish-European – and Germany for that matter- relations were perhaps at its best state in 2005 when Turkey secured the membership negotiations with the European club. Around the same time, almost 2500 kilometers away from the Turkish capital, Ankara, in the German city of Duisburg, growing Turkish community had been keeping the pulse of the local authorities to replace their small masjid with a larger mosque. The head of the mosque association, Necati Mert, had even a larger idea for the planned mosque. “We hired an architect and told him that we want a big glamorous Ottoman-style mosque. Our congregation was not sure if such structure would ever be approved by the authorities. It was unthinkable before but the circumstances were just right,” said 56 years old Mert who is from north east of Turkey. Surprised to most members of the mosque, the plan was approved by the Duisburg city council. The political atmosphere between Turkey and Germany were certainly a factor on the decision of the city, says Mert. The large Ottoman style mosque with 19 domes and the capacity to fit 1200 people was completed by 2008. During the following years, the previous so-called “back yard mosques” also took advantage of the political climate and the most received permission to build small minarets adjacent to the convert buildings. However, the relations between Turkey and Germany have soured again after the first decade of 2000’s. That is when the Turkish religious body DITIB in Germany had been planing to build a mosque in Ehrenfeld district of Cologne at a property it had previously purchased. 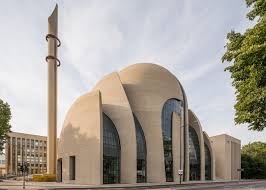 Knowing that German authorities would not consent an Ottoman-style mosque in the heart of Cologne because of the political climate, DITIB awarded a German architect for its mosque project to sooth the German politicians and the public according to many members of the Turkish community. The DITIB Central Mosque was completed in 2017 but its architecture also drew a lot of controversy. While tens of thousands of people around Germany were visiting this contemporary mosque, many members of the Turkish community also think that the structure does not look like a typical mosque and it was the main aim of the architect to calm the German public. The head of Yunus Emre Institution in Germany, Yılmaz Bulut says political climate has always been the sole factor to decide the architecture of the mosques in Germany. And considering the recent surge of Islamophobia in Germany, Bulut says mosques like the one in Duisburg may be far from realizing for decades to come.